We are one of the largest European OEM-independent service companies for combustion engines of all current types from 100 to 7,000 kW. Approximately 300 specialists are working in the headquarters in Spelle, our two branches and eleven service branches and offer qualified and practically-orientated services. They are capable and ready to meet always new challenges in the field. The five business units of our company represent the structure of the market specialization. Customer service is our top priority. Our customers' aims and strategies are important factors for our work. From the very beginning, we are in close dialogue with our customers to develop efficient solutions. Close cooperations of this kind have become the foundation for long-term and trustful business relations. Our aim is to preserve our regular customers and the striving to improve long-term customer relations. Routine surveys are assessed to strengthen the reciprocal commitment and to improve our quality standard. The knowledge about the needs of customers is the condition to satisfaction. Let us turn ‘customers to fans' and create our own economic boom. Our intention is to arrange an effective relation to our customers. We want to increase our market position by professional consulting and a better commitment of our established customers. Through this it will be more attractive for new customers to join us. The acquisition of potential customers is a foremost target. We want to adapt our range of products and services to customers' demands and generate new orders to increase in sales. Improved market presence and the personal attention towards new customers are strategic measures to ensure sustained growth. Full power and 100% quality are our criteria for all customer relations and for all client groups. „We are on the move“ is not merely a slogan, it stands for mobility, speed and dependability and as a warrant of success. Quality is the force of our customer service, however, competence in service shall not be considered as "Service for everything in the world". Our performance is not interchangeable, it is unique and it makes a sustainable growth possible. There is no alternative: product and service quality has top priority. The quality dedication in all company activities and departments has the support of the management. Quality does not only mean the quality of our products and performances but also the improvement of profitability to strengthen the equity base for a sustainable growth and an increase of the investment strength. The satisfaction and the investment into our employees is part of our company principles. We promote initiatives of our staff and stand for fair and open communication through all levels of the company. Only well-trained employees are willing and able to comply with our high quality standards. Our machinery, tools and equipment are subject to a constant improvement process, in order to be able to meet our quality standards and to achieve the highest customer satisfaction. All business decisions must be understandable and comprehensible for all people involved. Our personnel is responsible to meet our business policies within their area of responsibility. Quality standards, exercised in our daily contacts with customers, are applied to internal personal and business relations. Collegiality, cooperation and fairness justify the quality of contact.We continue to improve and to grow together in view of the background of the relation from human – material – engines – and the modalities of the environment. 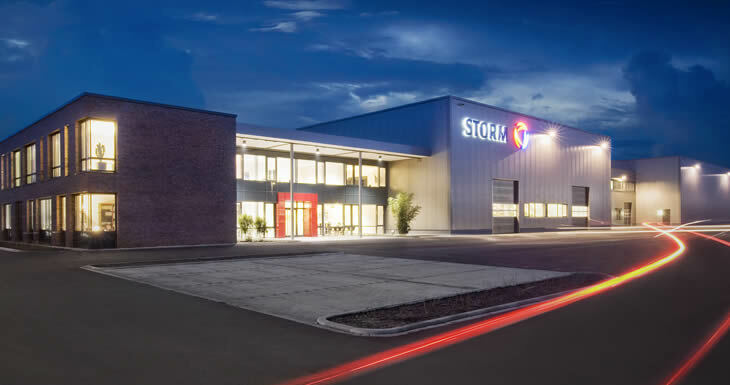 The objective of strategic personnel development at August Storm GmbH & Co. KG is to prepare the skills of the entire workforce for current and future challenges faced by the company. For that reason, on top of training young people, we strive to raise the qualifications of our long-term personnel. STORM takes its task as a responsible employer seriously. We benefit from the diversity of our workforce. Our competitive edge lies in their reliability and the high quality of their work. For their continuous deployment we offer our employees an extensive range of additional benefits.